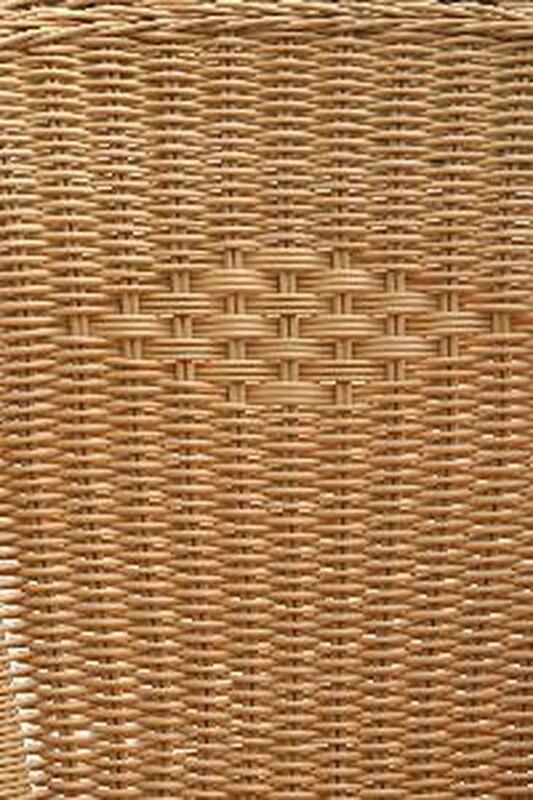 Rattan furniture is similar to wicker but uses thicker, heavier cords of wood to form the shape of the piece. Rattan furniture is generally either painted or glossed (with varnish or polyurethane) to protect the wood from wear and moisture. When the varnish on rattan starts to wear off, the wood itself becomes vulnerable to moisture damage and other problems, so it's important to re-seal it. Preparation includes getting the piece very clean and lightly sanding it so the new gloss will stick. Fill a gallon bucket with warm water and a dab of dish soap. Scrub down the entire piece of furniture, allowing the water to soak into the fibers of the wood. Rinse the piece very well with clean, warm water. Let it dry thoroughly for several days, preferably in the sun. The structure of the furniture should contract and tighten up as it dries. Sand the whole surface of the piece with 260-grit sandpaper. Fold the paper as necessary to get it into all the crevices. Use a hair dryer to blow away all the dust. Shake the can of spray finish. Spray it evenly over the surface of the furniture, starting at the top and working your way down on each side. Keep the nozzle about a foot from the piece, and keep it moving. Make it a very light, thin layer, with no drips. Let the first coat dry to the touch (about an hour). Apply a second coat in the same manner. Again, keep it very thin and even, working your way gradually around the whole piece and getting varnish into all the crevices. Let the second coat dry. Apply a third coat, if desired. Let the final coat cure for two days before using the furniture. Kevin McDermott is a professional newspaper journalist and landlord. He was born in Chicago and graduated Eastern Illinois University with a degree in journalism. He currently covers regional politics for a Midwestern newspaper. McDermott writes about home improvement for various websites.